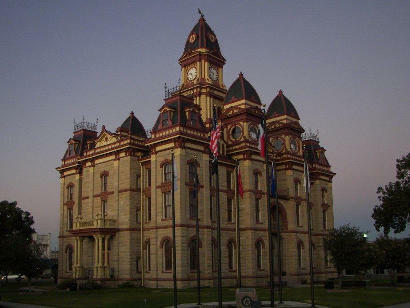 Lockhart Texas, Caldwell County Seat. 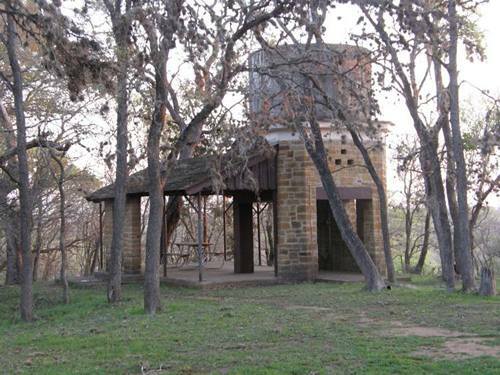 The Barbecue Capital of Texas is a mere 30 miles from Austin, The Legislative Capital of Texas. 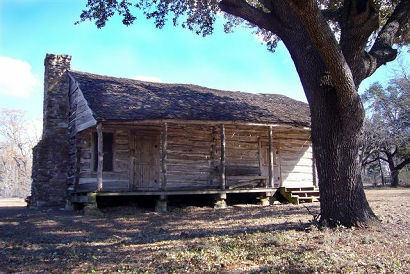 Site of the Battle of Plum Creek (1840), where the Comanches suffered enough casualties to retreat from central Texas forever, Lockhart was also the southernmost point of the Chisholm Trail in the 1870s. 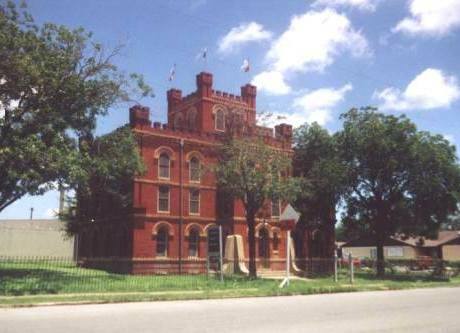 One block away is the former Caldwell County Jail, another interesting architectural piece. 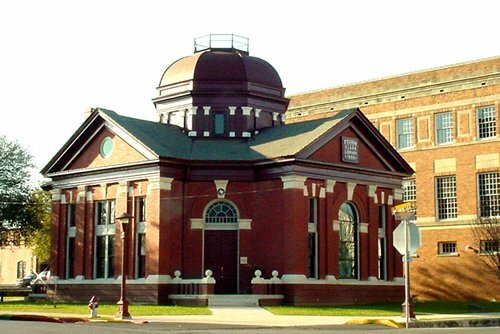 Now serving as the county's Museum, its hours make it very friendly to weekend visitors: Saturdays and Sundays 1 -5. 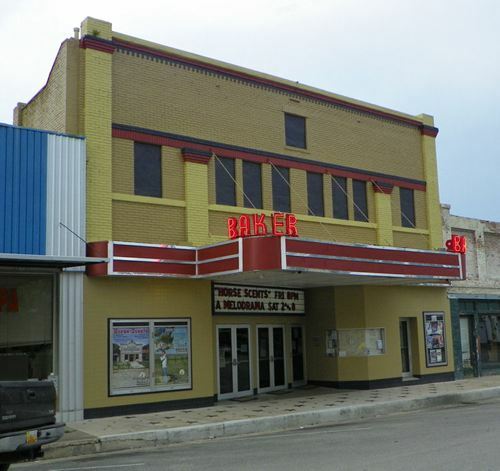 Across the street from the Clark Library is the old Baker Theater, which was recently bought by the Lockhart Theater Group. Members perform diverse plays and then continue with the restoration work (after changing costume). 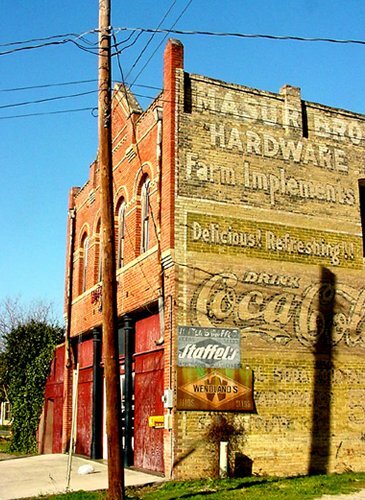 Antique stores are opened weekends as well. 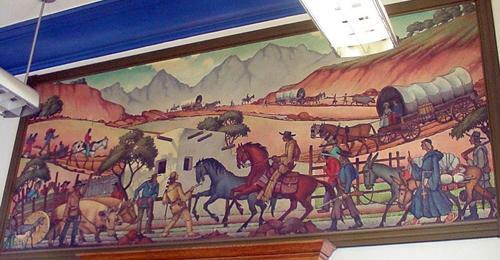 Lockhart Post Office Mural "The Pony Express Station"
Faded advertising off the square. 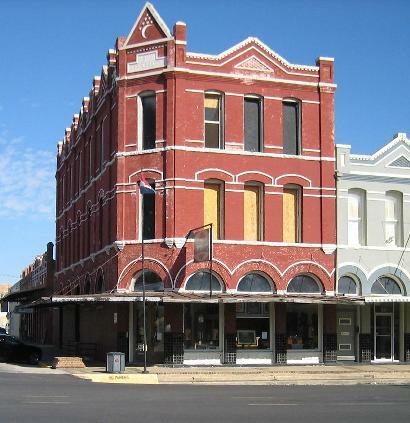 Lockhart Chamber of Commerce - 205 S. Main Street. My father was County Judge of Caldwell County from 1974 until early 1987 when he retired and then died of cancer in November of 1987. Leonard W. Scott was born in Staples, Caldwell County, on April 25th 1914, and lived there until the 30's. His family moved briefly to Karnes County where he met my mother, Bonnie Hinkle Scott from the Pawnee community of Bee County. 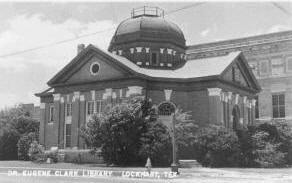 He returned to Lockhart by 1936 and worked for about $30.00 a month as a gas attendant. Mostly self-educated and a layman, Leonard became manager of a local tire & appliance business, served in WWII, became a small farmer and rancher and watched his business (Goodyear) outsell stores in Houston, San Antonio, and Dallas. After 35 years with Goodyear he retired and went straight into local politics. 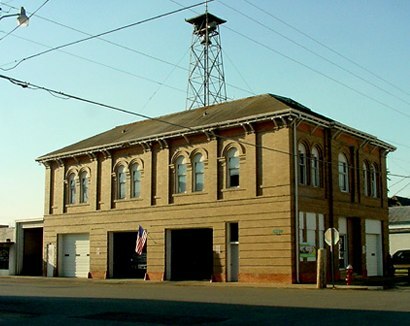 He was popular enough to get elected three times, helped revise the EMS system for the county, improved fire service, obtained grants for agriculture, and tried in vain to improve growth for the county. 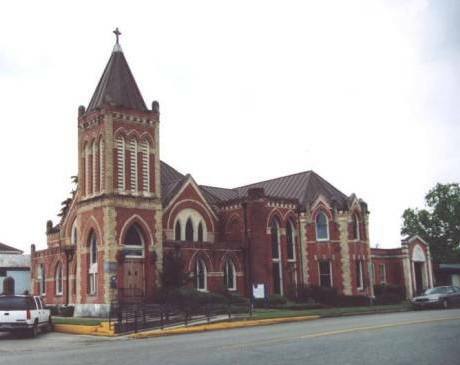 During all this time this layman held court then helped establish the first County Court at Law for Caldwell County in 1987. He also set up the first modern County Fire Marshal for the county. Leonard & Bonnie have three sons. 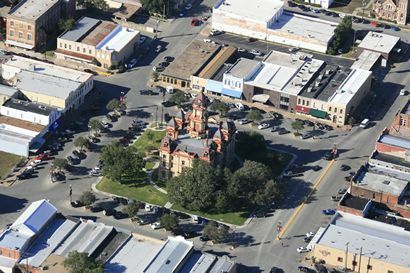 Leonard Wayne, a longtime Professor of Law & Mediation at St. Mary's in San Antonio, Mike, a Pharmacist with a local pharmacy for thirty years in Lockhart, now living in Grapevine, and Ricke, a retired Police Officer and the (past) second county fire Marshall for the county.